We have such beauty on our doorstep here in Cornwall, from breathtaking coastlines with secluded beaches and coves, to sprawling farmland and ancient woodlands. to give you some inspiration. Type of walk: It’s a beach, so nice and easy! There are so many amazing walks in Cornwall, I spent ages trying to decide on my favourite before realising the simplest is best. Having grown up in Cornwall, I sometimes forget to appreciate just how beautiful my surroundings are! 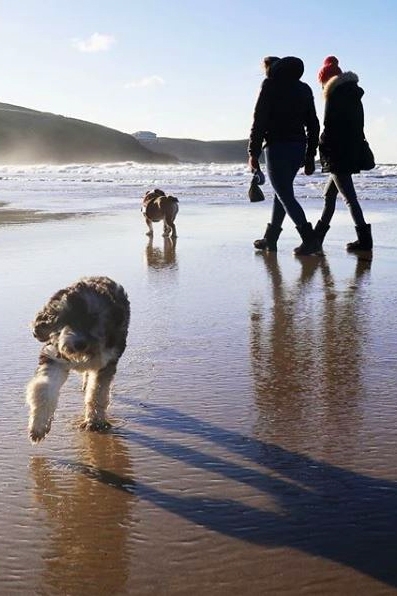 Holywell Bay Beach is right on our doorstep and you’ll find me down there with the dogs most evenings and weekends. There are so many different routes, from trekking across the dunes, to walking the shoreline, to exploring rock pools and caves. At very low tides you can see the wreck of the SS Francia in the middle of the bay, or head to the northern end of the bay to find the Holy Well the beach was named after. 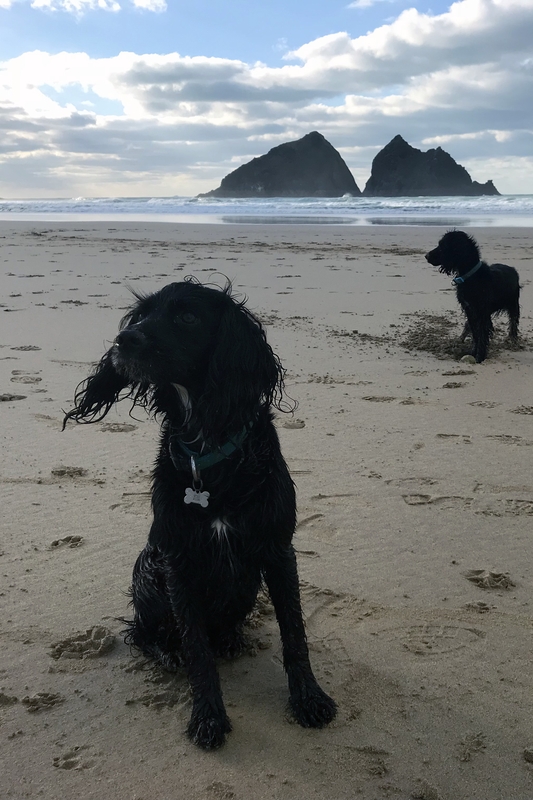 The distinctive rocks which have helped the beach find fame are known as Gull Rocks and of course I can’t talk about Holywell without mentioning Poldark; one of our highlights was when they were filming and Dr Enys stopped to stroke my sister’s dog! Parking is easy at the National Trust car park and after a day of fun you can treat yourself to a pint of Rattler in one of the two pubs. Perfect. Located on the most southerly point of Britain, with incredible views of the Atlantic Ocean, Lizard Point is one of Cornwall’s most striking walks in my opinion. It’s a very easy yet gratifying walk along the coast with a big car park and a fantastic little café called Polpeor Café serving one of the best cream teas in the county – the best pat on the back after completing the walk. I love to go there because of its perfect bird watching opportunities. There’s always an RSPB volunteer there to point out a range of species but more importantly the very rare and endangered (and rather shy) Cornish Choughs, who can be found dancing in the air above their nesting grounds on the sides of the cliffs. You can also watch seals sunbathe on the rocks close to the cliffs and swim amongst the colourful kelp. Another perk of this walk, for me being an avid beach comber, is the chance to find some really interesting colourful pieces of sea glass such as deep red and colbalt blue right next to the old lifeboat station. My husband and I have spent many hours just walking along the sea shore here and into the little cave on this beach, picking up some interesting keep sakes. 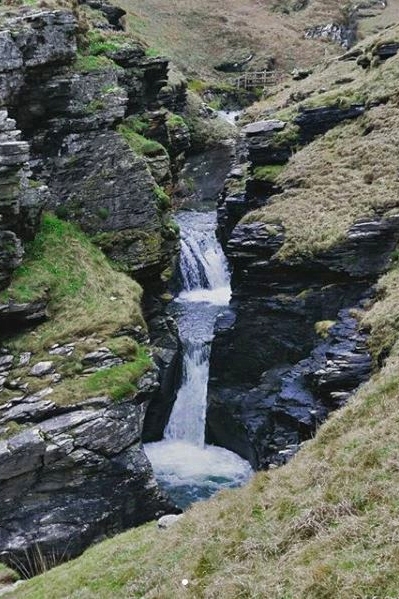 This stunning coastal walk runs between two iconic Cornish towns, the idyllic port of Boscastle with its curved natural harbour and the mystical town of Tintagel, the legendary home of King Arthur with Tintagel castle perched out on the headland. It’s possible to get a bus from Boscastle to Tintagel (or vice versa) or it can be done as a full day round trip of 11 miles. The highlight of the walk is rocky valley, where the path descends sharply and meets a stream carving its way through narrow cliffs, creating several small waterfalls and plunge pools before it reaches the sea. Alongside this there are countless sea birds, the odd seal and some of the best coastal views Cornwall has to offer! Our home town of Newquay can offer endless miles of picturesque coastline, ideal for a walk no matter what day of the week. A pastime favoured by locals of all ages, whether it’s a chance to get the whole family together and blow away the cobwebs, or off on a romantic stroll, there are numerous routes to choose from. One of my favourites, with a range of distances and options is around Pentire Headland, home of a local hotspot - The Lewinnick Lodge. The headland itself is ideal for shorter walks and has plenty of benches to sit and admire the views over the sea. A handy car park can let you drive straight up to the headland, or with surf hot spot Fistral Beach and the serene Gannel Estuary on either side, you can easily extend the route should you wish. Follow the well-worn pathway right the end of the headland, where you can feel totally surrounded by the sea and sky. The perfect sunset watching spot, or one of the most epic storm watching view points! Favourite walk: Lundy Bay…or The Rumps…I can’t decide so I’ve added both below! 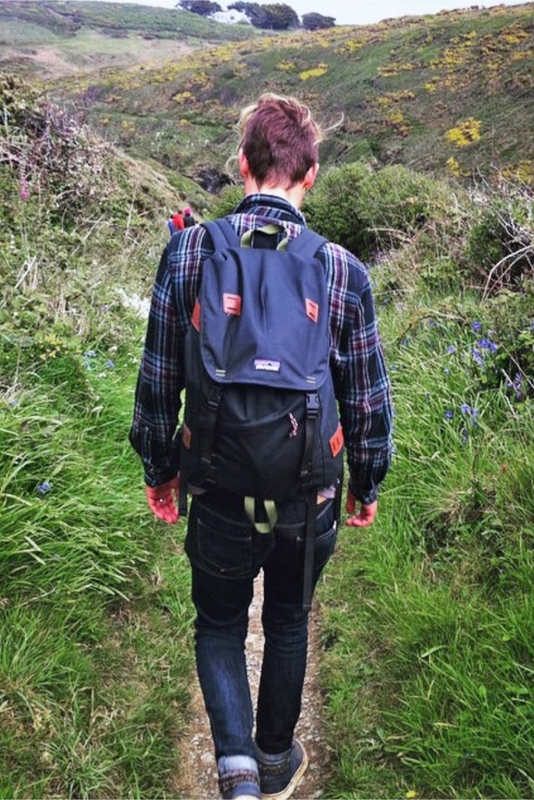 Type of walk: Lundy is relatively easy, quite rocky but there are steps down to the beach. The Rumps however is quite strenuous and long but well worth it for the views. Lundy Bay - First of all there’s a good car park for the walk at Lundy Bay near New Polzeath. It’s a National Trust so helps if you have a pass. You start by passing through beautiful woodland which opens onto sprawling open fields. Then on your left is a stunning lookout to the cove below, where wedding photographers can often be found taking breathtaking shots of brides and grooms. Carry on along this path and you’ll eventually come to Lundy Bay, a gradual sloping beach that is so shallow at low tide, it makes for a perfect paddling spot after a hot hike. At high tide though, there’s no beach left so make sure you time it right! The Rumps - As for my other favourite walk, also near New Polzeath, The Rumps offers some of the best year-round wildlife watching in Cornwall. Dolphins, seals, basking sharks and sunfish, along with both resident and passage seabirds. On a sunny day the sea looks crystal clear and aqua marine. There’s a 360 degree view all the way to the estuary at Padstow, and on clear days you can even see Tintagel in the distance. There are lots of quiet places to picnic on the way there or back from the car park at Pentire Farm, where you can look out over the ocean undisturbed. Perfect! Type of walk: Coastal and intermediate, (it is a bit steep in places). For a shorter walk you can start at Polly Joke. I think spring is the best time to do this walk. 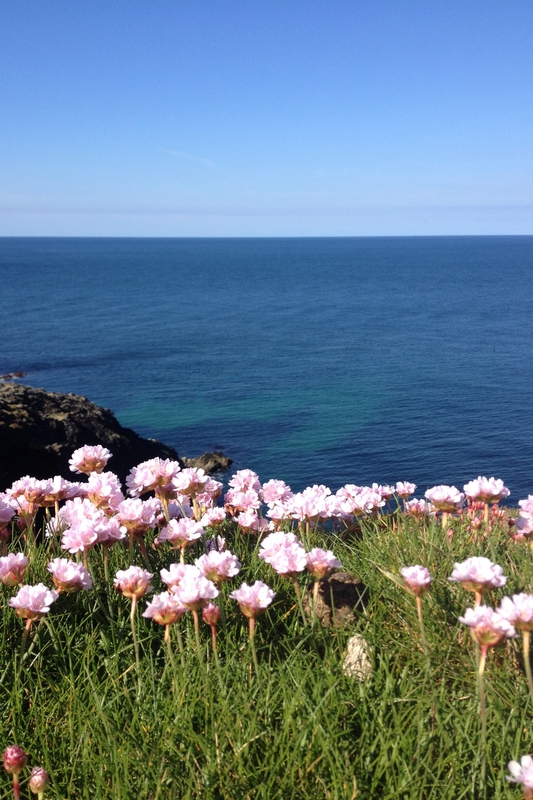 The coastal path is lined with what are known colloquially as 'pinks'. The sea thrift or sea pink flowers, (armeria maritima) can be seen all across this part of the coast at this time of year. If you are up early enough, you can walk over the cliffs to see the seals sleeping in a small cove just past Polly Joke. Just remember to be quiet and keep a safe distance from them and the cliff edge, especially if they have young pups. Later in the day, they swim out to sea and if you are keen-eyed you can spot the seals bobbing and surfing the waves. The National Trust has a circular walk you can follow, which takes you back up through Cubert Common, but I would also recommend stopping for vital refreshments at Holywell either at the St Pirans Inn, with views out to the dunes, or the Treguth Inn, a 13th century thatched pub a little further up. Located on Cornwall’s north coast, Perranporth beach consists of three, breath taking miles of golden sand. 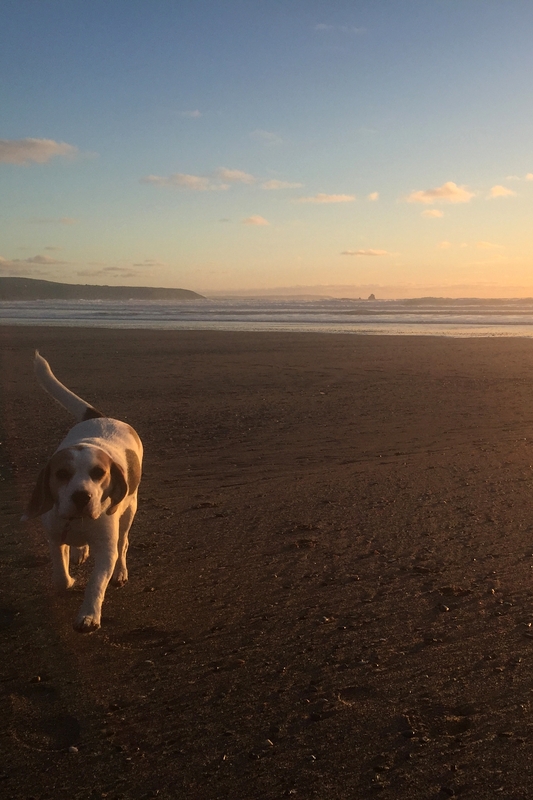 Famous for its ideal surfing conditions, this dog friendly beach is a favourite of locals and tourists alike. Alongside the sand and sea, the beach is home to Chapel Rock; a Cornish landmark where the county’s flag flies with pride above a natural sea pool. Towards the end of the three mile stretch you then reach Penhale Sands, a special area of conservation sheltered by miles of sand dunes. This is one of my favourite walks because I am lucky enough to say that it is on my doorstep and a firm contender every Sunday morning to blow away the cobwebs. There is nothing more satisfying than throwing on your warmest clothes and venturing out under the winter sun, only to be greeted with The Watering Hole on your walk back. This is the UK’s only bar on the beach, serving tea, coffee and a range of food and alcoholic beverages. My drink of choice after a long winters walk is an indulgent hot chocolate with marshmallows, allowing me to shelter from the wind and warm up before only a short walk home to my seaside flat. 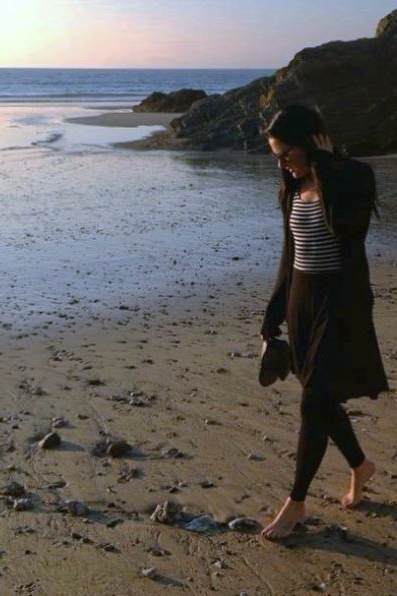 I have had many wonderful walks on this beach, it was one of my main reasons for relocating from the west midlands over three years ago now, yet each and every time I feel the sand between my toes I find another reason to fall in love with Perranporth’s incredible coast line!